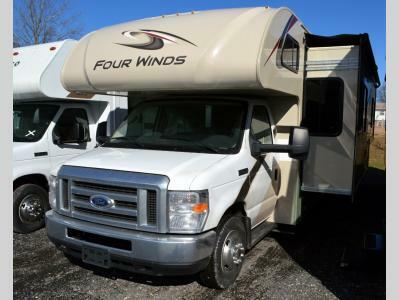 Your family will look forward to traveling in this Four Winds Class C gas motorhome every time you pack up and head to your favorite state park. 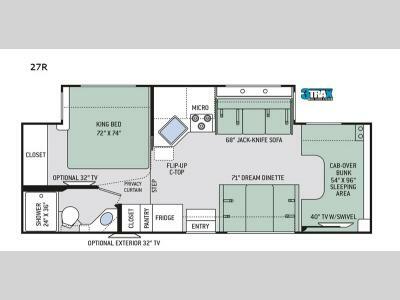 The kids will love the bunk over the cab with a 40" TV with a swivel so that they can watch cartoons in the morning. The 71" Dream Dinette can comfortably seat your whole family for dinner, and after your meal, you can relax on the 68" jack-knife sofa. This unit features a flip-up countertop that provides extra counter space when prepping meals, and you will love the three-burner cooktop for grilling up some burgers and the pantry for storing dry goods. After you've been driving all day, you'll appreciate the king bed in the rear bedroom. This bedroom also has an optional 32" TV for your enjoyment, if you choose.